Obamacare requires that most everyone have health insurance or pay a penalty - and the levy is set for a steep increase in 2015. 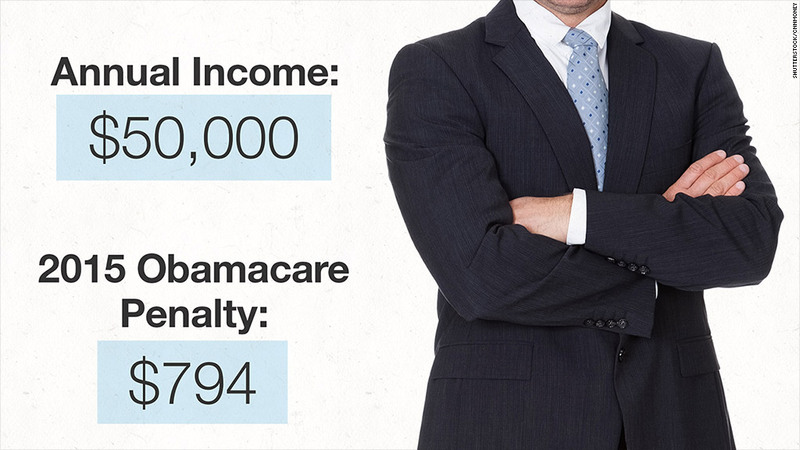 The 2014 penalty is just $95 or 1% of income, whichever is larger. In 2015, those without insurance will pay the larger of $325 or 2% of income. That means you could end up shelling out hundreds, or even thousands, of dollars for forgoing coverage. Take a single guy earning $50,000 a year. He will rack up a $794 penalty, according to the Tax Policy Center calculator. Under the flat rate, the uninsured would owe $325 per adult and $162.50 per child, up to a maximum of $975. Under the percentage rate, they would pay 2% of their income, above a roughly $10,000 threshold. The maximum penalty is the national average annual premium for a bronze insurance plan, which was $2,448 in 2014. Obamacare allows Americans to go up to three months without coverage. Some may also qualify for exemptions, such as if the insurance premiums exceed 8% of one's annual household income. Undocumented immigrants, members of Indian tribes and the incarcerated are also exempt. You'll pay the penalty when you file your federal income tax return. If you try to skip out on it, the IRS will withhold it from future tax refunds. After next year, the penalty climbs even more. In 2016, it's 2.5% of income or $695 per person, whichever is greater. After that, it's adjusted for inflation.